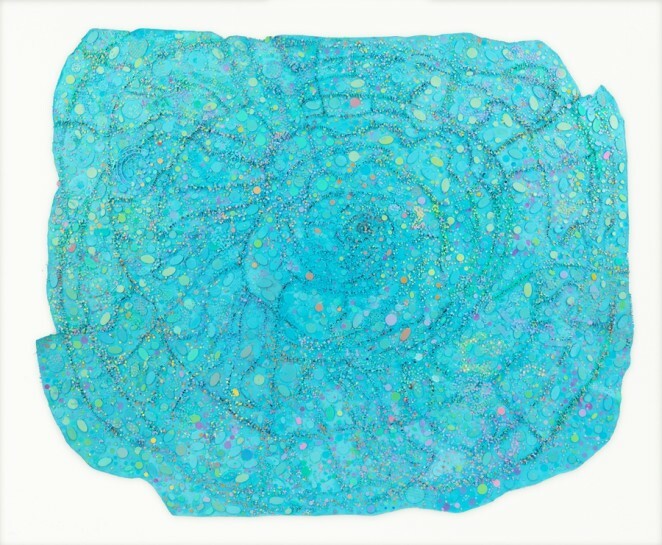 Best known for her abstract canvases encrusted with paper chads, Howardena Pindell has addressed a broad range of aesthetic and conceptual concerns in her art, a diversity further reflected in her work as a curator, educator, activist and writer. With ‘What Remains to Be Seen’, co-curated by Naomi Beckwith of the MCA Chicago and Valerie Cassel Oliver of the Virginia Museum of Fine Arts, the artist receives her first major travelling retrospective and a comprehensive look at a practice that spans over 50 years. The exhibition opens with a selection of figurative fauvist paintings that Pindell made while studying at Boston University and then Yale that foreshadow her turn to abstraction. The circles and numbers that would remain central to her practice appear in untitled abstract forays on graph paper from the late 1960s: ellipses in shades of yellow, red, and blue skittering across a page, and circled sequences of seemingly random numbers in the paper’s cells, that playfully revise the modernist grid.